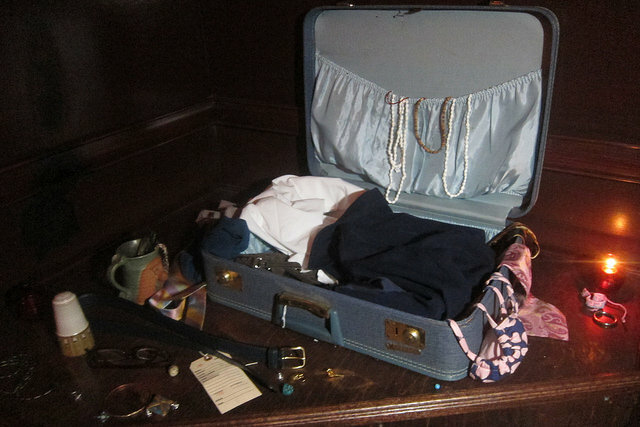 Lost Property Bar in Hollywood opened just three months ago and has already racked up an air of mystery. Currently open only 3 nights a week, Thursday-Saturday, the best night to check it out is Thursday. Reports elsewhere mention there are special treasures up for grabs but only if you leave something behind. Not quite true says one of the bar owners, Jeremy Lake (aka The Minty’s Hot Bartender from 2012). Jeremy says you can pick up one item from the the suitcase in the back corner of the bar without trading anything away. But I think most people including myself want to contribute to the treasure chest. Lost Property also serves food. We snacked on fries while dreaming of what to do with our treasures we gathered. I got a very flapper-esque necklace I’ll have to wear during the next Repeal Day party (or sooner!). Is it a panda? A kitty? A doggie? A baby seal? 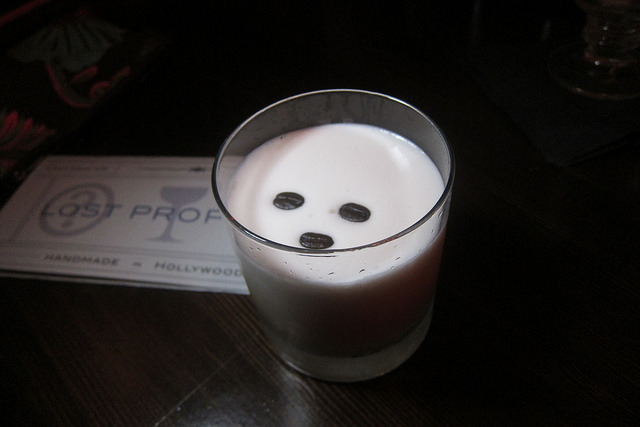 Either way, the careful placement of coffee beans makes this Howard Hawks the cutest drink at Lost Property. Plus it’s tasty to boot. Whiskey or rum? Why bother choosing when you can both? I couldn’t help but think of my fine dining partner, she would love the Lincoln’s Anecdote as she’s a bourbon fan. It’s complex with maple and spices but also still refreshing. It’d be easy to lose track and have a few of these. 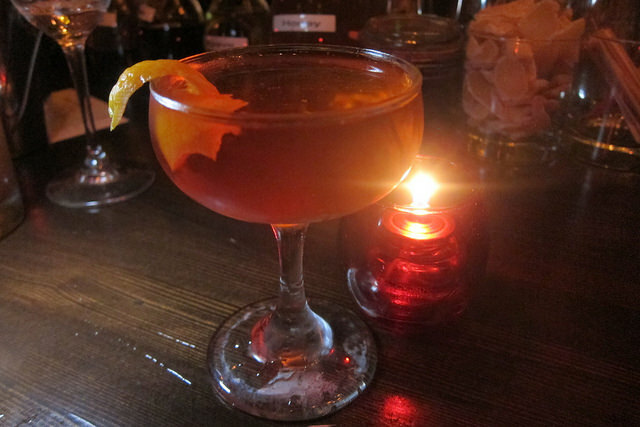 Besides original cocktails, there are a few classics on the menu that I consider a must try. I love Widow’s Kisses. Many because I love Chartreuse and Benedictine. Watch out though, this version uses Laird’s un-aged apple brandy which gives it a little bit of a kick… or kiss, you decide. I also tried a Tipperary (not shown) which is Teeling Irish whiskey, green chartreuse and sweet vermouth. If you like Bijou cocktails, give that other classic a spin. 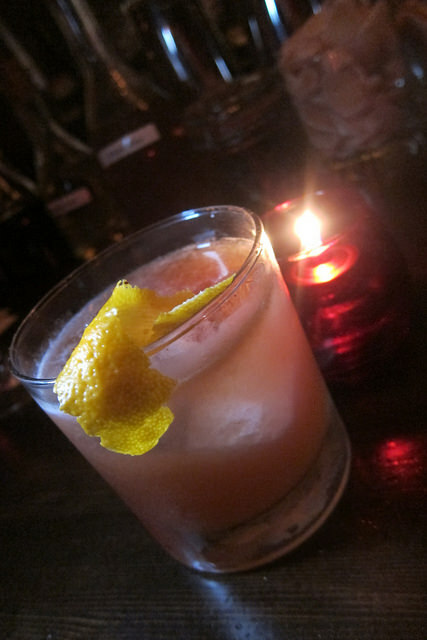 Widow’s Kiss – Old Overholt rye, Laird’s un-aged apple brandy, Yellow Chartreuse, Benedictine, bitters. Lately I’ve been obsessed with Ascendant Spirits’ Semper Fi blue whiskey which is made with three kinds of corn; red, white and blue. 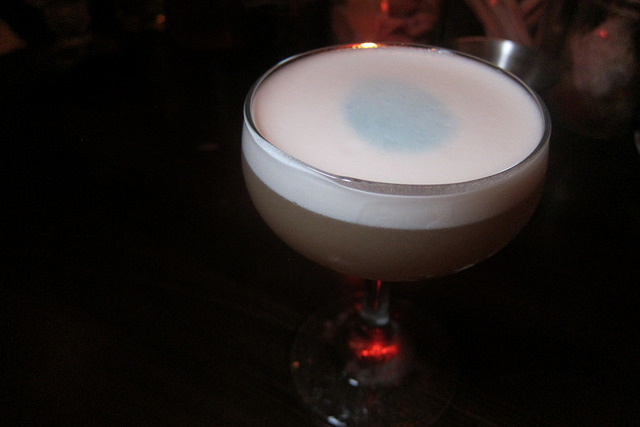 It’s showcased in this sour that’s beautifully finished with a tiny blue egg using a stencil and atomized creme de violette. Jeremy is still creating the cocktail list at Crossroads but for now, find him at Lost Property.